Weddings galore in 2014—and one newborn | Where to next? Memories of last year’s weddings came flooding back when I heard that one of the happy young couples have just had their first child, a daughter Elodie, on New Year’s Eve. Hannah and Mauro are the new mum and dad. We’ve known Hannah since she was five. She was a neighbour all those years ago, and Hannah and our Libby have been close friends since the 1980s. In fact, Libby was Hannah’s maid of honour. Their wedding was in Canberra’s Weston Park—a place where our families spent many memorable times. Over the years, Hannah has spent lots of time at our house. That said, I won’t embarrass her by posting a pic of her with our girls in our pink bathtub so many years ago (maybe another time). Hannah is a clever girl and a not-too-picky eater. I remember inviting her to dinner on many occasions. What are you having, she’d ask. Lasagne, I’d say. I’ll just check what mum’s making, she’d say. And within a few minutes she’d be back to say she was eating with us because her mum was serving spinach. Little did Hannah know that my lasagne had more than a half a pound of fresh baby spinach in it. I think that’s how she learned to like spinach. But I digress. Back to our year of weddings and, no, neither of my kids got married this year. Last month I was in the USA for a family wedding—my nephew, Charlie, married another Hannah. Charlie and Hannah attend university in Oklahoma, but they got married in St Louis Missouri, which is near Hannah’s hometown. The wedding night was great. Charlie was so enthusiastic that he said I do about two sentences after the celebrant (his brother-in-law) started to speak. Got a great laugh from the crowd. I didn’t take as many pictures as I’d have liked but here are a few. In the middle of the year, we were spectators at a couple of weddings in Central Asia. The ones that stand out were in Khiva and Tashkent in Uzbekistan. Can’t find the pics from the those weddings, so will have to add those someday in future. 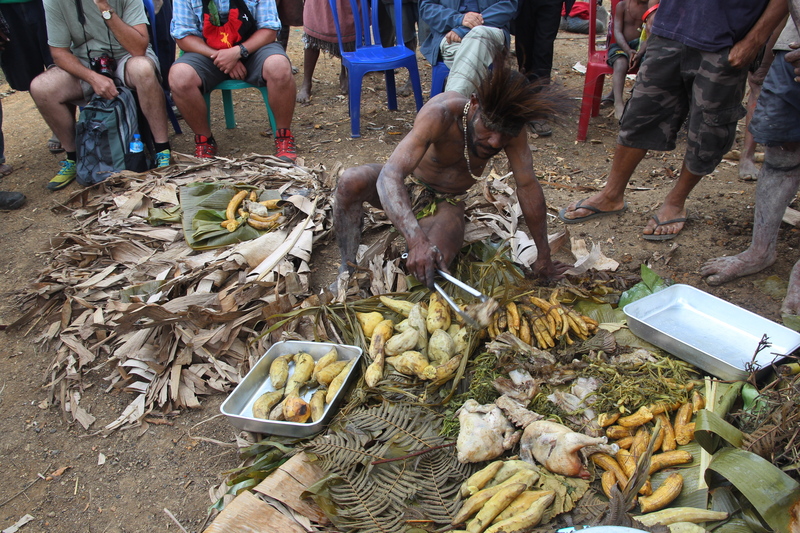 But the knockout, mind-boggling wedding of our year was in September in Papua New Guinea. 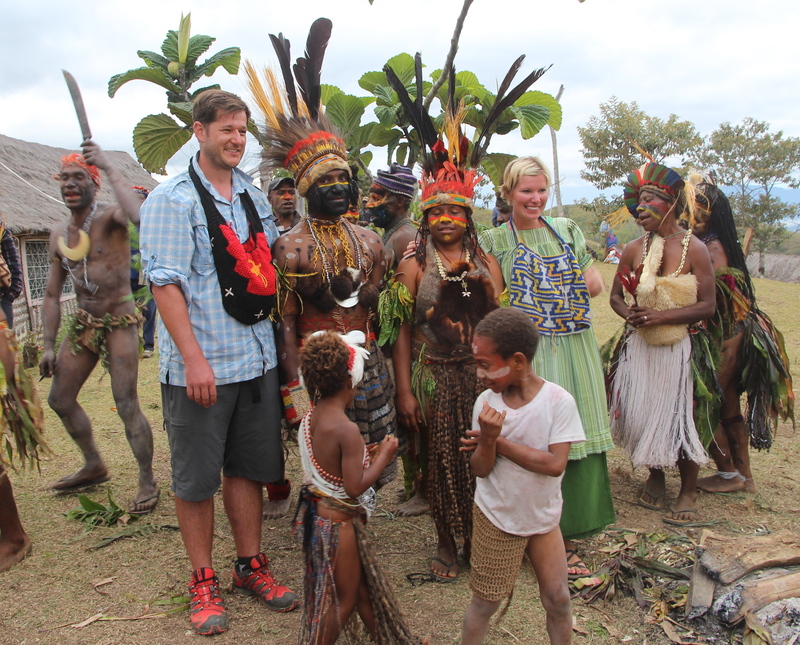 I’ve already introduced our time in the Asaro village in PNG’s highlands but I haven’t told you about the mock wedding they held on our behalf. It gave such wonderful insight to the customs and culture of just one of PNG’s many tribes. And it gave us plenty of great photo opportunities and lots of amazing food. The young couple, both teenagers, were no doubt strong-armed by their families into playing their parts for the nice foreign guests. We were part of the groom’s entourage. And step one was to go along and offer a bride price. It’s not really so much to ‘purchase’ a bride, but for the bride’s family to recoup some of the money they lay out to prepare her for betrothal. The village headman told me that when his daughter reaches a marrying age (gets her period, I suppose), he will seclude her for two weeks, and slaughter a pig every day to feed her and others. Good grief, I love pork but I don’t think I could eat it for 14 days in a row. Anyway, our mock bride didn’t have to do that, but the bride’s and groom’s families came together in the centre of the village to negotiate the ‘marriage price’. One negotiation was the night before and another followed the next day. The bride’s family drove a hard bargain and our groom ‘paid’ six pigs and a whack of PNG money. In return, the bride’s family prepared a mumu (a feast of roast pig). The groom’s family prepared chickens (chooks) and veggies. The pig was led up the hill to be slaughtered and the process wasn’t that bad. The pig slayer came along and bonked the pig on the head. Truly knocked it out with one blow. And then slit its throat. The pig was then cooked in a pit lined with hot stones. It took hours and hours. So did the cooking of the groom’s contributions. I felt bad that a pig was slaughtered on our behalf, but it really was part of helping us to understand the local culture and customs. Interestingly, the best bits of the pork (especially the crackling) were given to the groom’s family by the bride’s family. One of the most interesting aspects was seeing the groom being decorated for the occasion. The bride got the same treatment, but we weren’t party to that. That’s because our group was divided in two and half spent the preparations with the groom and the other half with the bride. What a wonderful and memorable experience you had back then, even if part of it was the sickness. Thanks for the compliments on my blog, and the follow. I’m checking out yours too—and following with pleasure. Thanks Peggy! Have a great day! Thank you. I always to try write something that relates to the pictures, and I suppose I’m always photographing with some story in mind. It’s really cool what you do, just go on like this, you have a new fan! Wow, thanks. I love your blog too. Perhaps I was thinking of Buffy the Vampire Slayer. Glad it hit your funny bone. What a great variety of weddings in this post. I really liked Hannah’s bouquet and the next Hannah ‘ s dress. Love all the feathers also! Hannah’s bouquet was the prettiest one I’ve ever seen. Really gorgeous. I would be remiss if I did not say a few nice words about Hannah and Mauro’s wedding. As said, her dress is very pretty and the flower arrangement is beautiful… and the Canberra Park setting is perfect for a wedding. Second, Hannah and Charlie’s wedding in Nebraska/Missouri must have been special for you, to go back and see family. Here I go again LOL, Charlie saying “I Do” a few times, before the ceremony speaker started to talk. Aside- my mother’s name is Hannah… that makes three, do not know anyone else with that name. Further, the PNG mock wedding and photos again were interesting, colorful and told a complete story (and your wording) about the wedding. I still feel sorry for poor little piggy who got BONKED… ouch. But then again, everyone had a good feast and a tasty meal. The three weddings were all completely different and all completely wonderful. And Hannah is a rather popular name in Australia. Love how you contrasted the all the wedding ceremonies on one post – fascinating! Thanks. I hoped it would be more interesting to ‘bundle’ them. Thanks so much, that is very thoughtful. Unfortunately I have decided not to accept awards for the blog (it’s mentioned on the ‘A bit about us’ page. This is because when I’m travelling remotely (almost all our travel is remote) I have very limited internet time—often just enough time (or credit) to get an actual travel blog item done. Hope you understand. I feel very, very honoured with a big smile on my face. Thank you so very much. Very interesting…and so different. Wish I could say we had so many weddings to attend in 2014. Unfortunately it was the worst year ever for us…we had at least 10 deaths, friends and a few relatives. So sad was 2014. Hope 2015 looks better. Thanks for following and reading my blog. A very sad year indeed. Hoping for your sake that 2015 is filled with joy and optimism. Love all your sites. nominated you for an award. Thanks so very much for thinking of me. Most appreciated. Unfortunately I have decided not to accept awards for the blog. This is because when I’m travelling remotely (almost all our travel is remote) I have very limited internet time—often just enough time (or credit) to get an actual travel blog item done. Hope you understand. And one other comment, the link above takes me to a page that I am not authorised to access. I completely understand. Awards take a lot of time. I will go back and find correct link. Thanks so very much. Hope your year is wonderful too. Amazing, however how can you and John be certain you weren’t married off from one another amongst all the pagentry? That’s amazing that you got to witness weddings in Uzbekistan (twice) and PNG within the same year! It’s always awesome to stumble upon wedding celebrations when travelling. I witnessed the end of a wedding when I was in Greece and another one in Cuba a few years later. The Cuban Bride was kind enough to allow me to take a photo of her and her father as I was walking past her Bridal party when they were taking photos within Old Havana. Oh you’ve got me excited now. We’re going to Cuba next month and I’ll cross fingers that we see a wedding. We have 12 nights, all with homestays, so we could get lucky. Is your Cuban photo anywhere online? Such a fascinating share of a single event in different cultures. Everyone sees a wedding as a source of celebration, and everyone gets hung up on the little details. Some just usually matter more than, oh, the lettering on a favor label. 🙂 Thanks so much for sharing this, and hope you and Poor John are well! You eloped! Goodness, soul mates born for the roads unknown. I’m pretty sure that if Bo and I dared attempt such a thing, my mother would have hunted us down with a helicopter….